The following was taken from Jewish Cemeteries, La Grange, Columbus, Hallettsville, copyrighted 1999, with the permission of the author, Norman C. Krischke. The full text can be viewed at the Fayette Heritage Museum & Archives. 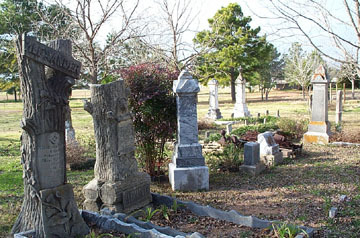 The Jewish Cemetery at the south end of Vail Street in La Grange, Texas was officially established by the La Grange Hebrew Benevolent Society in 1868, but there were three graves at the site prior to their acquistion of the property. The name of the society was later changed to "Ladies Hebrew Cemetery Association" and the last surviving member of the organization, Essie Alexander, sold the property, 5.467 acres of land, in 1957. The current owners are Mike and Linda McBroom. The cemetery fence on the west and north sides was wrecked many years ago; only pieces of it remain. Part of the fence on the south and east sides is still standing. L. David Vogel of La Grange, President of the local congregation Temple Israel in Schulenburg, Texas, has taken charge of the restoration and continued preservation of the cemetery. Many thanks go to Tonya Hettler, for retyping Mr. Krischke's data for this web page.